There were three main sessions at the first day of the First International Workshop on Rock Physics, 1IWRP. Experimental methods, Digital rock physics, and Methods in rock physics, a softer, more philosophical session on perspectives in the lab and in the field. There have been several sessions of discussion too, occurring after every five presentations or so, which has been a refreshing addition to the program. I am looking for talks that will change the way we do things and two talks really stood out for me. Mark Knackstedt from Digitalcore in Australia, gave a visually stunning presentation on the state of the art in digital rock physics. You can browse Digitalcore's website and and view some of the animations that he showed. A few members of the crowd were skeptical about the nuances of characterizing microcracks and grain contacts near or below the resolution limits, as these tiny elements have a dominating role on a material's effective properties. In my opinion, in order to get beyond 3D visualizations, and the computational aspect of pixel counting, digital rock physicists need to integrate with petrophysicists to calibrate with logging tools. One exciting opportunity is deducing a link between laboratory and borehole-based NMR measurements for pore space and fluid characterization. In an inspired and slightly offbeat talk, Bill Murphy 3 from e4sciences challenged the community to make the profession better by increasing accountability. Being accountable means acknowledging what you know and what you don't know. He offered Atul Gawande's surgical writings as a model for all imperfect sciences. Instead of occupying a continuum from easy to hard, rock physics problems span a ternary space from simple to complicated to complex. 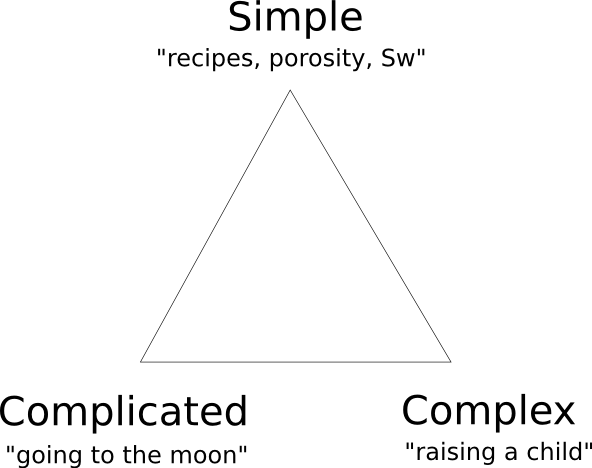 Simple is something that can be described by a recipe or a definite measurement, complicated is like going to the moon, and complex is like raising a child, where there's an element of unpredictability. Part of our profession should be recognizing where our problems fall in this ternary space, and that should drive how we deal with these problems. The next time you are working on a problem, why not estimate where it plots in this ternary space? It's likely to contain some combination of all three, and it might evolve as the project progresses. And ask your colleagues where they would place the same problem—it might surprise you.